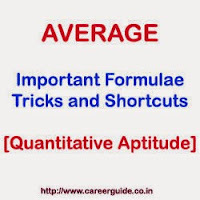 Here are important formulas and shortcuts to solve problems on Average. Basic knowledge regarding solving questions and problem on average is important for various competitive exams like IBPS, SBI Bank PO, assistant, SSC exams, Railway exam, UPSC exams. Average is central value of a set of data. Like we have two numbers 10 and 20, central value of 10 and 20 is 15 which is called average. Average is sum of all items divided by their numbers. I. Average of n items = Sum of n terms / n.
Example: Find average of 23, 46, 54, 55, 36, 26. Soln: As there are 6 numbers so average = (23 + 46 + 54 + 55 + 36 + 26) / 6 = 240/6 = 40. Example: Find average of first 11 natural numbers. Soln: Average of first 10 even numbers = 10/2 + 1 = 6. V. Average of first n natural odd numbers is n.
Example: Find average of natural odd numbers up to 10. Example: If average of five consecutive numbers is 63. Find the sum of 2nd and 4th term. Soln: As N is odd, middle term that is 3rd term is 63. So we can write, 1st term = 61, 2nd term = 62, 3rd term = 63, 4th term = 64, 5th term = 65. Hence: sum of 2nd term and 4th term = 62 + 64 = 126. Soln: As average of middle two odd terms (3rd and 4th) is 46, so middle two odd numbers are 45 and 47. So we can write 1st term = 41, 2nd term = 43, 3rd term = 45, 4th term = 47, 5th term = 49, 6th term = 49. Problems on Average Practice Model Test Paper - 1 with Answer key and Detailed Solution. Average Practice Model Test Paper - 2 Data Sufficiency with Answer key and Detailed Solution.